HISTORY and A&E continue to explore the wonders of our galaxy and its strange unexplained phenomena with the arrival of Ancient Aliens: Season 10, Volume 1. Originally presented in the 1968 best-selling book Chariots of the Gods, by Erich von Daniken, the theory of “ancient aliens” rocked people’s beliefs in mankind’s progress. 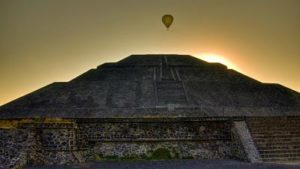 Ancient cave drawings of strange creatures, remains of landing strips in Peru, and Indian texts that describe the “flying machines of the gods” were just a few of the odd archaeological artifacts cited by von Daniken as proof that ancient astronauts were well known to our ancestors. On this latest season of science fiction-tinged documentary, the investigators uncover more astonishing new evidence of extraterrestrial intervention on Earth than ever before, including an aluminum object that resembles the foot of a lunar lander . . . but inexplicably dates to over 40,000 years ago. In India, a thousand-year-old mask is discovered that looks identical to the face of a grey alien. Newly uncovered records from Russia indicate that in 1948, an ancient rocket was discovered in Kiev. Is it possible that we are on the brink of a reconnection with our alien ancestors…? This season of the series, which runs nearly six hours, premiered July, 2015, on the History Channel. Overall, the series remains as colorful, fun and delciously tabloid-esque as it has been since its premiere in 2009!